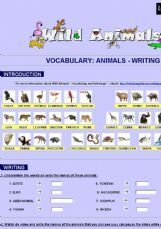 Online exercise consisting of 3 parts: how to spell animal names (16 animals), where animals live (continents) and what they eat. 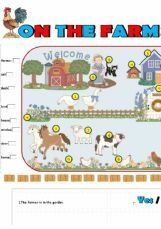 Can be used with both young leaners and older students (level elementary, pre-intermediate). 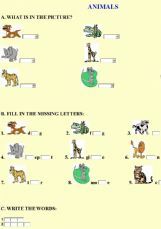 Animals for young learners: 1. What is in the picture? 2. Write the missing letters 3. Write the words. 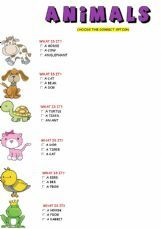 Pets - Basic vocabulary for beginners. Garden bugs. I made it thinking of Victoria Ladybug, who is always so kind and helpful. Her great work is an inspiration. 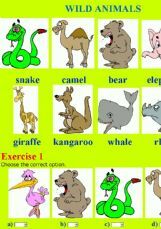 wild animals and exercises with "can" and verbs fly, run, jump, swim etc. Don�t miss this AMAZING Book for young Kids!!! Brown Bear, Brown Bear, What Do You See?" is one of the most famous questions in children�s literature. The story introduces a series of animals asking the same question, "What do you see?" It�s my favorite! 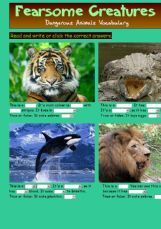 It�s excellent to teach colors and animals!!! Eric Carle (born June 25, 1929) is a children�s book author and illustrator who is most famous for his book The Very Hungry Caterpillar, which has been translated into over 30 languages. Have fun!